• The restaurant at the boutique Hotel Montefiore is a must dinner stop. After all, this is the place to see and be seen. It seems all of the top designers and architects and others I spoke with had dined here. During my one-week visit, I visited here twice and I saw that the liveliest spot to dine is the bar, rather than the adjacent dining room. Here I sat alone beside a couple celebrating the wife's 30th birthday. But I didn't feel alone for long. After ordering several appetizers -- the shrimp salad with cellophane noodles, and the Four Nams, small egg rolls that you wrap in lettuce and mint leaves -- they soon ordered vodka shots, poured some for me and invited me in several toasts. You gotta love Israel -- this never happened to me in New York City. The restaurant offers a fusion Vietnamese menu and, though I didn't find every dish memorable, the atmosphere definitely was. • Down the street from Hotel Montefiore, a new wine bar, referred to simply as The Wine Bar, is set on a corner of Nachalat Binyamin Street at 15 Montefiore Street. This two-floor glass ensemble provides an intimate venue on the top floor where you can snuggle with your date at the solo table while looking out at the large glass windows. I sat at the bar on the ground floor sipping a wonderful Chardonnay from the Golan Heights -- an area known for its wines. Though most of the varieties are from Israel, you can also find wines from Chile, France, Australia and Spain. They also serve food: I vote for the ravioli stuffed with lamb and garlic and the excellent creme brulee with pomegranate. 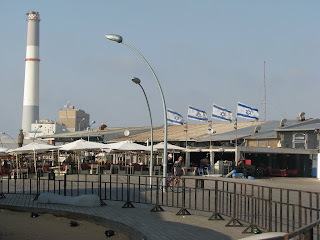 • On the old Tel Aviv Port waterfront which has been renovated into a shopping, dining, nightlife venue. Among the many options, I chose to hang out at ultra-laid back Shalvata. This restaurant/bar is most noted for its outdoor patio complete with thatch umbrellas and sofas with plenty of colorful throw pillows. I wish the weather was cooperative because I would've hung out staring at the sea. But with the cool weather, I retreated to the spacious interior where a palm tree pierces the reed ceiling, a wood burning stove sits in the middle of the space and the bartenders are plenty willing to chat. • Also on the old Tel Aviv Port, the Coola Spa is a hidden gem for women. This women's only day spa is so much more. It's a place where they offer everything from belly dancing classes to movement therapy. Sited on the waterfront, coming here on a sunny day allows you to sit outside on a lounge chair and enjoy the sea views. Their treatments are plenty varied, including Japanese, Chinese, Hawaiian and Indian massages as well as a even a Tibetan treatment. Chocolate lovers, like myself, can opt for a chocolate treatment. They're really got something for every woman, including those who are pregnant. It's really more like a regenerative day retreat. 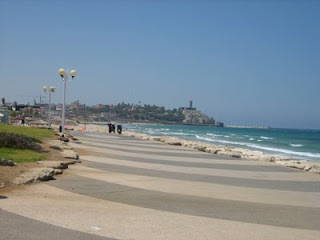 • In Jaffa, just south of Tel Aviv's center, I found a restaurant with the most wonderful location. Babai is set right on a windswept seafront with nothing to impede the ocean-front views. Sitting beside the tall windows, I wanted something light so I asked if I could just have a mix of dishes, a little humus, baba ganoush, that sort of thing. Wonderfully, 15 small individual plates arrived, each with a tasty salad: baba ganoush, lentils with onions, curried cabbage, tomatoes with garlic, tabouli and much more. Plus, warm pita bread. These simple but varied dishes and a view that can't be beat makes this a winning locale. Really good post, super chilled out time in Tel Aviv, such a good place.